Last week, I had the honor of signing copies of my memoir, Wild Within: How Rescuing Owls Inspired a Family, at Wild Wings Birds of Prey Facility in Honeoye Falls, upstate New York. I got to meet Hercules, a red-morph Eastern screech owl. Here’s a travel article I wrote about Wild Wings a few years ago, for The Boston Globe. Enjoy! Me with Bodhi, the Barred owl star of Wild Within: How Rescuing Owls Inspired a Family. If You Go to Wild Wings . . .
27 Pond Road Honeoye Falls, N.Y., 585-334-7790, www.wildwingsinc.org Fri-Tue 10 a.m.-2 p.m. Free; donations welcome. Find Wild Wings on Facebook! And on Twitter! Categories: New York, Raptors, Wildlife | Tags: birding, birds, birds of prey, eagles, environmental literature, falcons, family travel, hawks, Honeoye Falls, Melissa Hart, memoir, Mendon Ponds, nature, New York, owls, raptors, travel, travel writing, upstate New York, Wild Wings, Wild Within, Wild Within: How Rescuing Owls Inspired a Family | Permalink. From where I stood, I could see the little boy round the corner of a shelf and skid to a halt with his mouth open. I felt his awe. In front of 50 or so people on folding chairs at the Avid Reader in Davis, California perched three raptors–a burrowing owl, a Western screech owl, and a great horned owl. Staff and volunteers from the California Raptor Center spoke about the birds and their work as raptor rehabilitators in conjunction with a reading from my new memoir, Wild Within: How Rescuing Owls Inspired a Family—a book about how I learned to train owls for educational presentations such as this one while waiting 2 1/2 years to adopt my daughter. A week later, she and my husband and I visited the California Raptor Center. On a sunny September morning, we parked under oak trees and met another volunteer who led us around the wood-and-wire mews. (Raptor folks call their big bird cages mews.) Such centers exist around the world; often, they’re open to the public on specific days of the week or during annual open house celebrations. Staff and volunteers perform a multitude of duties–they treat injured birds of prey who may have collided with a car or ingested rat poison or tangled with a cat; they hand-feed orphaned baby birds with the goal of releasing them into the wild; they feed resident birds and clean their mews daily; they do educational presentations for the public on the natural history of the birds and on the importance of raptor conservation. Resident raptors live at such centers because they have permanent injuries. A bird of prey with one eye or a bum wing or an unhealthy preoccupation with humans (usually because it’s been illegally raised from an egg) can’t hunt in the wild. These birds can live over 20 years in captivity, thanks to staff and volunteers who dedicate their life to serving them. Mikey, a red shouldered hawk at the California Raptor Center, arrived in 1996 as a chick. Staff discovered a lesion in one eye; the eye eventually disappeared. He’s an education bird, which means he’s calm around people when sitting on a glove or perch for an educational program. After we looked at the birds on display at the raptor center, we stepped into a wonderful little museum. Here, adults and children alike can spend hours learning about raptors. We looked at the taxidermy birds (much easier to examine than their live counterparts behind wire) and dissected owl pellets. Owls swallow their prey whole, but can’t digest bones and beaks and other sharp parts. They cough up a pellet which volunteers dry and then set out for visitors to pull apart in search of rodent skulls and other fascinating tidbits. 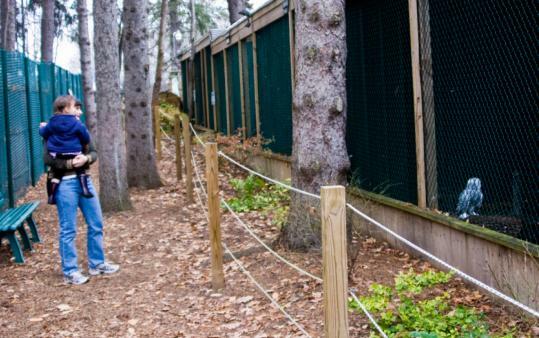 Interested in visiting a raptor center in your area? Partial List of Raptor Centers in the U.S. If you can’t find one close to you, do a search online and prepare to be awestruck! Categories: Northern California, Raptors, Wildlife | Tags: adoption, animals, birding, birds, birds of prey, birds of prey environmental writing, bookstore, California, Cascades Raptor Center, Davis California, eagles, falcons, family travel, hawks, Melissa Hart, memoir, nature, osprey, owls, raptors, The Avid Reader, travel, U.C. Davis, vultures, Wild Within: How Rescuing Owls Inspired a Family, wildlife | Permalink.